Dressing up as a showbiz stars for a calendar was another excuse for residents at the Lions Village Anglesea to get together for a cake and a laugh, according to resident Norma Cormick. Norma and her husband Peter have lived in the 18-unit village since 2002, after moving to the coastal town from Mildura three years earlier. All 21 residents get on well and enjoy spending time together in the community hall, Norma says, so when Executive Officer Tim Liston suggested they work together to create a fun calendar, everyone was enthusiastic about taking part. The bus trip to select outfits, the day of the dress rehearsals, and the main event – when they put on their finery and had their makeup applied by TAFE students – all provided plenty of opportunities for the residents to have a laugh and eat cake, Norma says. 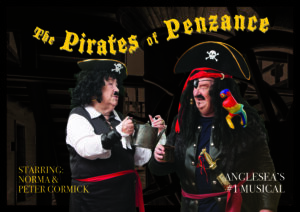 Norma and Peter star as the motley Pirates of Penzance in the musical-themed 2017 calendar, that also features residents dressed as the stars of hits such as The Phantom of the Opera, Wicked and Cats. Friends and family have loved the finished product, Norma says. With thanks to Norma and Tim at Sirovilla.